It's been a long time since I have participated in a challenge at this site, but I used to be a regular. Jenn Borg welcomed me with open arms as she does everyone. The Design Team and the other entrants are just as friendly and welcoming. Since I'm having to grab small bits of studio time I decided maybe I could whip up an ATC. 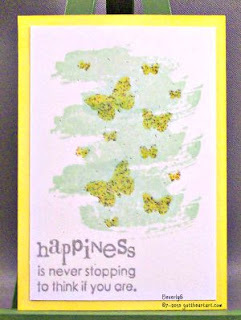 So with some Stampin' Up products and a bit of Stamp-n-Stuff embossing powder this was my result. I don't think the photo shows the sparklyness of the rainbow crystal embossing powder, but a bit of sparkly never hurt a few free flying butterflies. If you are familiar or not with ATC's take a bit of time to click on the link above and check out some fun pieces of art. Stampin' Up Products--So Saffron cardstock, Whisper White card stock, inks: Pistachio Pudding, Daffodil Delight, Smoky Slate, Stamp Sets: Font for You, Perpetual Birthday Calendar, Work of Art. Versamark ink, Stamp-n-Stuff Rainbow Crystal embossing powder, Stamp-A-Ma-Jig.